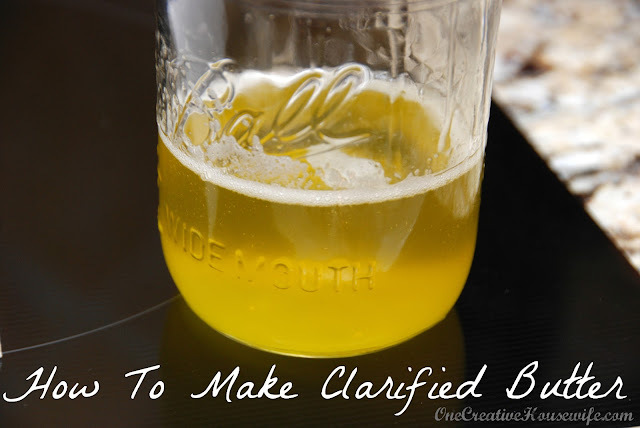 Every so often I come across a recipe that calls for clarified butter. When I make it, I usually make a batch and keep it in the refrigerator, because I like to have it on hand for seafood or steamed veggies. You can make any amount of clarified butter that you want, but you have to remember that you will loose some of the butter during the process. 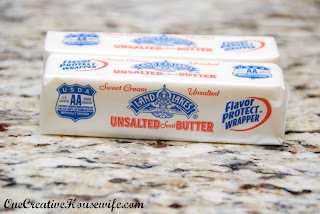 The general rule of thumb is that that you loose about 1/4 of the butter you start with. 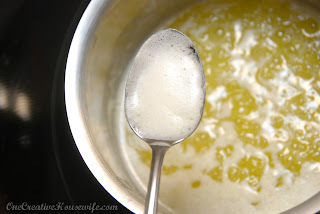 In the example I have pictured I started with 8 ounces of butter and ended up with about 6 ounces clarified butter. 1.In a saucepan, heat the butter over low heat. Once the butter is melted, let it simmer until a foam rises to the top of the butter. 2. Skim most of the foam off with a spoon. 3. Line a mesh strainer with cheesecloth, or of you're really in a pinch (like me) use a coffee filter. Place the strainer over a heat proof container. I use canning jars. Clarified butter keeps in the refrigerator for 1 to 3 months.